The Scary Truth About Pet Car Seats. And What Really Saved Our Pup’s Life. Picture both you and your dog one sunny morning, patiently waiting at the stop light. You hear loud music from afar and look up to see an SUV racing towards your vehicle. As it gets closer your heart starts to race, you attempt to maneuver out of the way, but are too late. The next few moments are a blur, but what you do remember is seeing the car that hit you drive off without a care in the world. Dazed and confused you look to the back seat where your fur baby is and thankfully they are okay. They are a bit shaken up, but still intact and no major injuries. Yes, we were victims of a hit and run situation a few months ago. The experience was very terrifying, but it made our family so appreciative of our choice pertaining to pet car safety. For as long as many of us can remember, we’re taught to “buckle up” and use our seat belts to protect ourselves in the event of a car accident. But what about our four-legged companions? What protects them? Nearly 40-50 million U.S. households have pets, and roughly 84% of people DO NOT properly restrain them while traveling in a vehicle. A frightening statistic says that nearly 37,000 people die each year in the U.S. from car accidents, and an additional 2.5 million are either severely injured or paralyzed each year. You can only surmise that there is a large percentage of pets whom are also injured, or even worse, killed. Furthermore, The American Humane Association estimates that nearly 100,000 dogs die each year from riding in truck beds. These statistics alone should give any pet owner a moment of pause. Before you run down to your local pet store for a crate, carrier or harness there is something you should know. Majority of the products being sold in stores are not only inferior (I was going to say crappy), but there exists only a small handful that keep your pet safe in the event of a real life collision. Another chilling fact is that U.S. Manufacturers are NOT required to perform crash testing on pet travel products. Essentially, a company can launch a canine car restraint product to the masses, market the heck out of it and be oblivious to its effectiveness. Scary isn’t it? The Center For Pet Safety, founded in 2011, is a non-profit, pet safety advocacy group, conducts regular studies and crash testing on pet carriers, harnesses and crates. It was uncovered that majority of the manufacturers who stated that they had conducted their own crash tests, were referencing something called FMVSS 213, or the Federal Motor Vehicle Safety Standard-Child Restraint Systems. This sort of testing is the gold standard, but what CPS discovered is that the manufacturers were only testing the medium size of their product, as opposed to the entire size range. In addition, a manufacturers definition of “passing” a crash test was largely subjective. A major red flag. During The Center For Pet Safety’s first year of operation, a pilot study was conducted on some of the highest quality seat belts for pets. Care to guess how many passed the basic safety criteria? ZERO. They had a 100% failure rate. Luckily, with rise of the “humanization of pets” companies are taking notice and beginning to put the consumer before profits. A pet safety harness crash test was done in 2013, and in 2015 a crate and carrier crash test was done by CPS. Wait, what about those pet booster seats that we see many people use? According to CPS, booster seats places your pet in danger zones, such close proximity to glass, airbags and in line with the heads of adult passengers. In a nut shell, you might want to think twice before using one of those booster seats for your fur baby, no matter how comfortable it may look for them. Also, let’s be honest, since when were seat belts meant to be comfy? Test Results: “Manufacturer arrived at MGA Research to witness a tandem test of two new Sleepypod Mobile Pet Beds, one with the PPRS Handilock and one without. Center for Pet Safety’s team conducted the test using two CPS 15 lb. simulants. Both Sleepypod Mobile Pet Beds successfully met Center for Pet Safety’s criteria for a successful product performance. The simulants were fully contained and the carriers remained wholly connected to the test bench for the duration of the test.” (NOTE: While the manufacturer believes that “tufting” the Velcro (opening and closing the connection several times) will fully resolve the adhesion issues of the Velcro and successfully secure the carrier, Center for Pet Safety feels it is in the consumer interest to recommend the use of the PPRS Handilock with the Sleepypod Mobile Pet Bed). With summertime here, it’s imperative that we all become more cognizant in the area of pet safety. Many of us are traveling with our families, college kids coming home to visit and not to mention the countless parties involving alcohol. During the summer months traffic accidents tend to increase exponentially, so much that the period between Memorial day and Labor Day are known as The 100 Deadliest Days of Summer. This study alone was enough to open up our eyes (and hopefully yours). 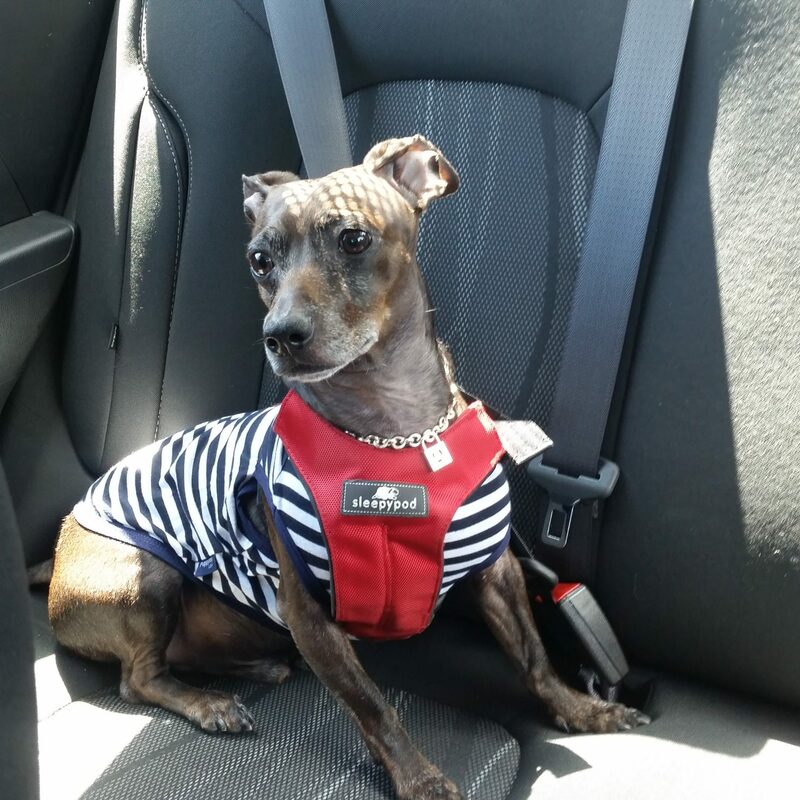 We are ever so grateful that we stumbled upon it (months ago) and went out and purchased the clickit sport harness (which he is pictured using). Sure it took some getting used to, but it’s effectiveness and ability to keep Angelo safe was proven. Do you use properly restrain your fur babies when taking them for a car ride? If so, what do you use? Comment below and don’t forget to share!